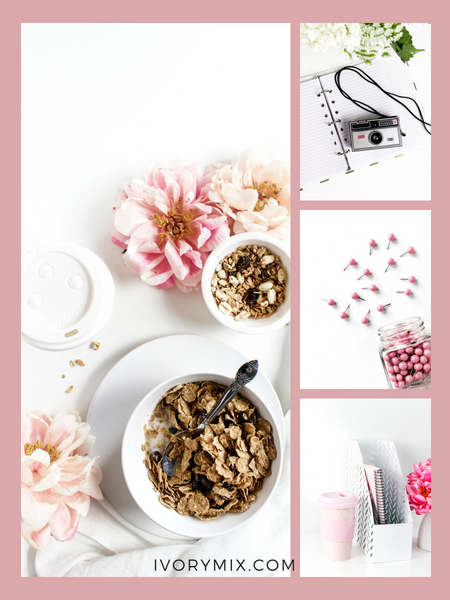 One of the staples in my stock photography business is supplying bright and white flat lays and photos. Over the years, I’ve been able to perfect the ability to create pure white backgrounds without overexposing or damaging other areas of my photos. As a professional photographer, I use adobe products like Photoshop and Lightroom. However, those programs come with a cost (as little as $10 a month). I know that most business and blog builders are on a tight budget when it comes to adding services. 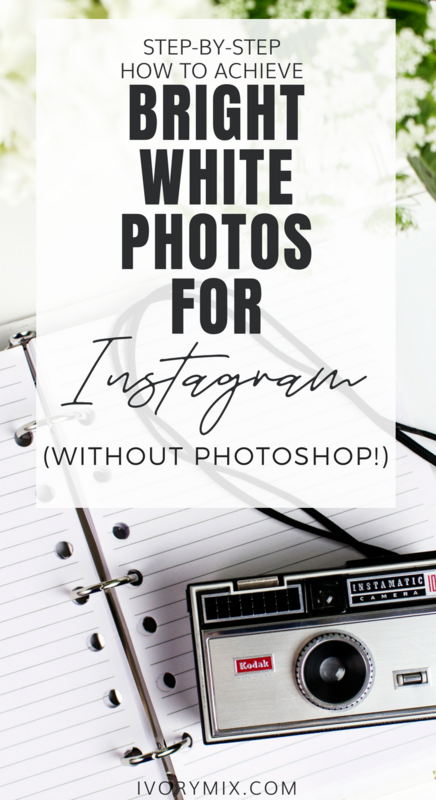 So, today’s tips will be all about how to create white and bright photos without the use of advanced programs like Photoshop. 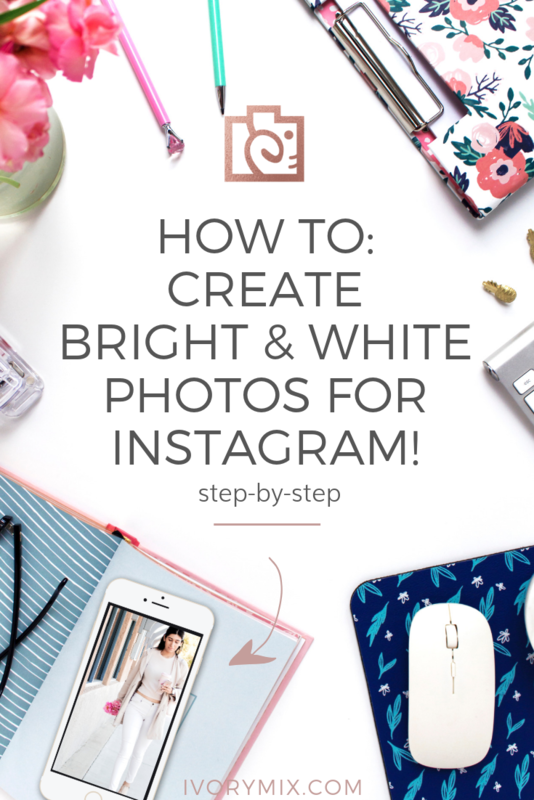 The first step in creating a bright white photo, especially those like flat lay’s on a white background, is making sure that your background is indeed as close to bright white as possible. 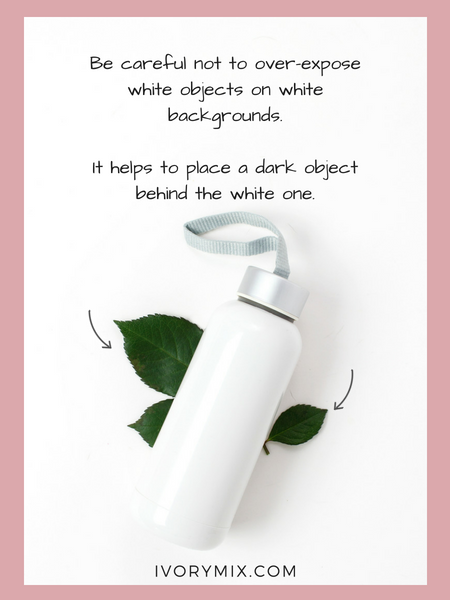 There are many shades of white out there and you would be surprised how often you can buy foam core backgrounds or paper/cloth backdrops that appear white online or in the store but are more off-white when compared to other white colors. The best thing you can do is bring something with you to the store when purchasing your backdrops so that you can compare colors. You’ll want to avoid white colors that have a yellow or blue tint. Lighting is one of the most important aspects of photography. There are many types of lighting you can use from natural filtered light through windows, direct sunlight, or light from filtered bulbs (like lamps). In order to create even lighting and a bright photo, it’s best to practice a few simple techniques. My first choice is always to use natural filtered light through a window. The best time of day is usually 10 am. After some practice of your own, you’ll likely find that natural filtered lighting through a window is the softest and even lighting you can get. For some, this is hard to get because you either work during the day, have few windows in your home or lack space near windows to stake your photos. The second choice would be filtered lighting from lamps. You can use lamps of any kind, just be careful of color. The color quality of lighting will play a big role on the brightness and whiteness of your photos. For instance, sunlight at 12 p.m. has more of a blue tint whereas sunlight at 6 p.m. can appear more yellow. So, if you are using natural light for your photography, it’s better to pick a time during the later morning and continue to take your photographs around the same time if you are a mean for consistency. If you plan to use lighting from lamps, aim to use light bulbs with a daylight color. 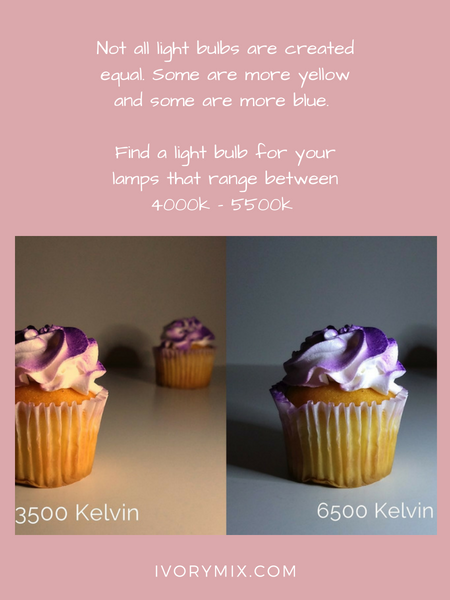 Get a lamp with a color range from 4500 Kelvin to 6500 Kelvin. The higher the number of kelvins, the bluer the light will appear. The lower the number of kelvins, the more yellow-orange the light will appear. Like this Continuous Softbox Lighting kit below comes with a 6500k bulb. 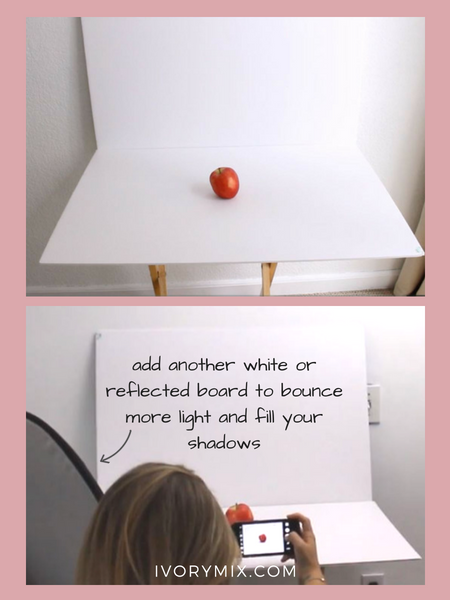 If you’re having issues with shadows in your photos, then purchase a second whiteboard or get a photography reflector from Amazon to help reflect more light onto your surface which will fill the Shadows and make them lighter in color. Like this Collapsible Light Reflector shown below. 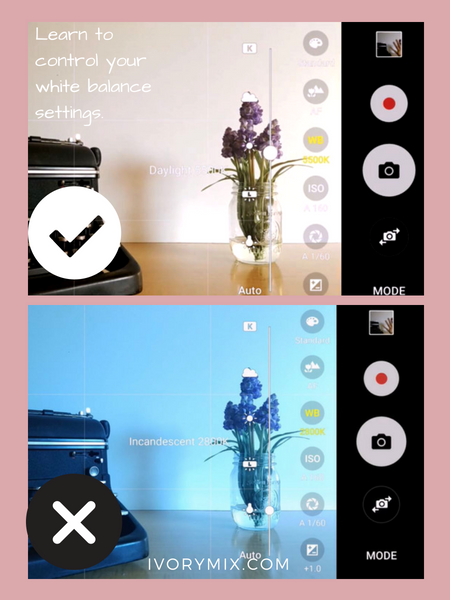 Although you may go through every effort to use the best lighting, it helps to understand how to manage your white balance settings on your camera or smartphone. The more you control white balance when taking the photo the better your images will turn out and require less editing after. Looking for more advanced tips? Click here to grab 12 free photography lessons sent straight to your inbox. One thing you might try to do when taking photos is increasing the exposure before you take the shot. This could lead to what is known as overexposure which creates big white spots and faded objects. The alternative is decreasing the exposure to avoid those big white spots but be careful to underexpose creating large dark spots. Aim for a sweet spot when are you have no areas of the photo that are too white or too dark. 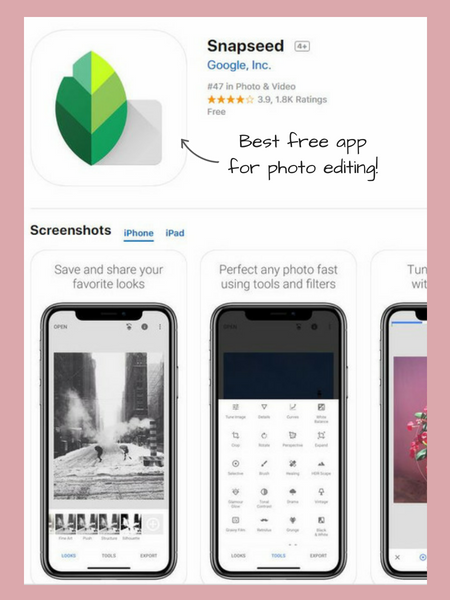 Last but certainly not least, you can use free tools and apps like my favorite Snapseed which is available on iPhones and Androids. This app allows selective editing to the nth degree. To show you what I mean I’ve included a video displaying how to edit parts of a photo with a white background to make the background even more white. Thanks so much for such an awesome post. I needed more insight on how to take pictures of my craftivities and I am thrilled to have found your site!